1XP won't boot! What should I do? My windows XP won't start. I shutted down the computer yesterday, today when I started it it will run till the windows boot screen, when the bar reaches the end the screen will stay black and nothings happens. I tried to boot in safe mode but after loading the drivers it just stays there as well and wont go on with the boot. Is there a way to run a repair or a scandisk to try and solve the problem without reinstaling windows? If you don't want to reinstall your Windows XP, you need another bootable CD or USB drive to access your computer and repair your XP system. Have no idea about it? Here is my recommendation: Wondershare LiveBoot Boot CD/USB. You can use it to make a bootable CD or USB and fix your XP issue. After purchasing this software, you'll get a download link and a license from Wondershare. 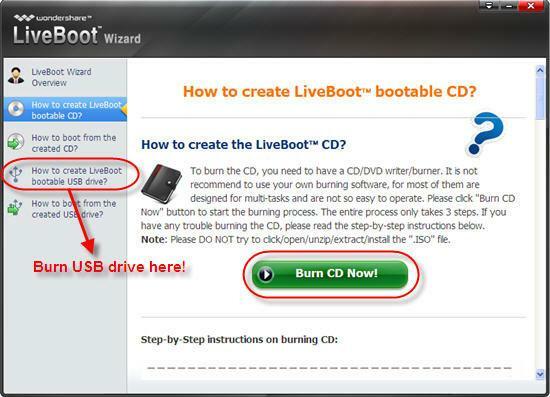 Download and install it on a working computer, and then follow steps below to create a bootable CD/ USB drive and solve your XP boot issue. Run the program and it'll provide a wizard about how to create a bootable CD or USB drive and use them to boot your computer. You only need to prepare a blank CD or USB drive and insert it into the computer. Then follow the guide in the window below to burn a bootable CD or USB. Actually, all you need to do is to perform a click on the green burn button. When the burning work is done, take out of the bootable CD or USB and insert it into the computer that can't boot. Then restart the computer, and press F12 button when the system begins loading. Next, a Boot Device Menu will appear. Select "Onboard or USB CD-ROM Drive" in the menu, and you'll get a window as follow. 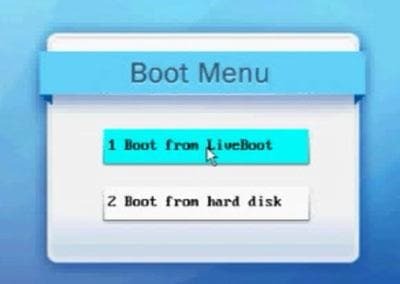 Click "Boot from LiveBoot" to access your computer. Generally, the "Windows XP won't start" is a kind of loading crash problem. Therefore, when the Wondershare LiveBoot 2012 is launched, choose the "Windows Recovery" option and select "Loading Crash Solution" under it. Here it describes the symptom about loading crash problems and offers relevant solutions to fix them. You can try them one by one to get your issue done. 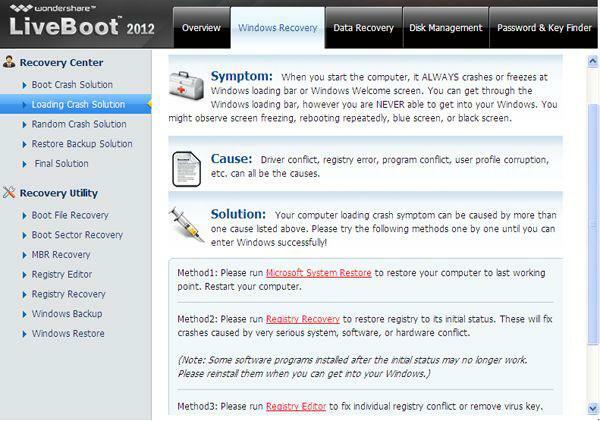 When the problem fixed, take out of the LiveBoot CD/ USB drive, and restart your computer as normal. Then you'll find that you can boot your computer successfully as normal. XP won't boot often comes along with data lost from your hard drive,with the wrong operations also will result in hard drive formatted and inaccessible data, but you did not have a recently data backup.Under these circumstances,you will need a hard drive data recovery program to help you retrieve you lost data back. How to recover lost data from hard drive on Windows computer.